Perform a ceremony to read the Elder Scroll. Find a Moth Priest's draw knife. Gather bark from a Canticle Tree. The first objective in this quest is to find a Moth Priest's draw knife. As you can see on your map, the place to do this is the Ancestor Glade. The closest place to fast travel to is Falkreath. Take the eastern road out of Falkreath and continue until you come to a four-way intersection. Following the south road will lead you to Peak's Shade Tower, while the northeast and southwest roads lead to Pinewatch and Halldir's Cairn, respectively. Turn left onto the northeast road and you will soon reach a bandit outpost consisting of two wooden towers connected by a wooden bridge standing over the pathway. Shortly after you hit the bandit outpost, there will be a small mountain path marked with a pile of stones to the right. Take the mountain path to the right and you will find a bandit camp with a tent and bedroll, as well as a tanning rack and firepit. If you are looking to the right of the camp, you will again see the mountain path, so continue on it as the dirt trail leads into the snow. Follow the trail until it stops, where you will be facing a rock wall. If you look to your left, you will see a pile of rocks. Past this rock pile on the right is a pile of rocks marked with a flag. Continue past the flagged rocks and you will see a second flagged pile of rocks where the trail resumes. Follow it and you will reach the entrance to Ancestor Glade at the top of the hill. To find the entrance, head left on the pathway and look for a cave on the right. Enter the cave to continue the quest. If you told Serana to leave you, she will be back with you once you enter the cave. Once in the cave, continue straight and up to the left a bit so you are in a wider cavern with trees. To get to where you need to go, continue up to the left so you are on a ledge. You can cross to the other ledge by going over a tree. Continue on the obvious pathway and you will hit a rock area that is lit up. Go left (the only way you can go) and continue on your journey. You will come to a huge cavern with a weird light shining up. If you look down you will see there is now an actual pathway with stairs further on so go down that path. The path will turn sharply, almost invisibly to the left so be careful that you don't miss it. Before you turn left, if you look straight you will see stairs in the distance. There is a stream separating you from the stairs. Jump down and turn right on the stream. Walk through the part where water is dropping down and keep going. Right after the little "rapids" in the stream, there is a rock to the right with a shield and a dagger on it. After taking what you want, follow the objective marker from the stream to where you need to go. Activate the draw knife holder to get a draw knife. Canticle trees are everywhere but the closest one is to the north side of the place where you got the draw knife. After you have obtained some bark it will tell you to attract Ancestor Moth swarms. All of the moth "swarms" are flying around the Ancestor Glade and are in no predictable position so you just have to run around and find them. To collect them, simply run by them and they will start to follow you. After collecting the moths, go back to where you got the knife and enter the column of light. Read the Elder Scroll (Blood). You must collect 7 moths and that will take about 3 minutes of running through various swarms. You cannot proceed until the objective pointer appears in the beam of light. 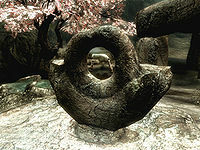 After reading all three Elder Scrolls you will see a map-like object that is glowing. Notable features include two red symbols, the one at the lower left representing the ram of Markarth, and the one at the upper right representing the wolf of Solitude. The lines represent rivers. 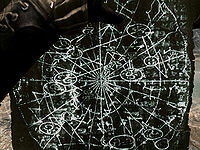 The location of Auriel's Bow is shown by the small white symbol, similar to the Elder glyph , near the head of the river in the top-left quarter of the map. Look at it for a while and your vision will white out. Once you regain your vision, you will be back at Ancestor Glade, with the map having disappeared. Talk to Serana and she will ask if you are okay. Regardless of what you say, she will ask about Auriel's Bow and you will say "It's in a place called Darkfall Cave". She will ask where it is and you will say "The scrolls gave me its exact location", even though it's quite hard to find the cave in your vision. After that you complete the quest and the quest Touching the Sky will start. As you leave the cavern, you will be ambushed by Dawnguard Soldiers or Vampires, depending on whose side you chose in the Dawnguard questline. Your other follower is automatically dismissed upon entering Ancestor Glade. You can keep your second follower by telling them to 'wait here' while outside Ancestor Glade. You must do this before entering otherwise the second follower will be dismissed. Once the quest is completed, exit Ancestor Glade and your second follower will still be outside. Simply tell your second follower to follow you again. None of the Elder Scrolls can be removed from your inventory. When on the Dawnguard's side, it is possible to sell two Elder Scrolls to Dexion Evicus. The Elder Scroll (Dragon) can be sold to Urag gro-Shub, but only if you did not buy it back from him. Once you have started the moth collecting endeavor the exit to the glade is barred. This prevents your character from discontinuing this quest and going back out into Tamriel wearing a cloud of moths. If you transform into different form (Vampire, Werewolf, etc) while gathering moths, all existing moths will disappear around you, but will not interfere with the ongoing quest count. Serana may not have entered the glade with you and is shut out behind the barred gate. To fix this, you can wait a couple hours and she will appear next to you or you can reload and make sure she follows you into the cave (possibly needing to use Unrelenting Force) or while looking at the closed bars, move to the left and glitch outside of the level by walking into the wall, then jumping over to the area on the other side of the barred doorway and go back inside the level. Alternatively, you can try to give move commands to Serana by holding down E while facing her until you can command her. After obtaining the Draw Knife, you may not be able to harvest the bark from the Canticle Trees. Leaving and re-entering the glade may correct some problems but indicates the scripts aren't working correctly. You may be able to harvest from the canticle trees, but the objective for attracting moths will never appear. Use the console command SetStage DLC1VQ06 30 to set the objective to gathering moths. The barred gate may not shut. You may not be able to read the scroll. Add a second copy of the Elder Scroll to your inventory with player.additem xx0118F9 1. You end up with two copies, but should be able to read the extra scroll. The post scroll reading attack may not occur. The gate may not reopen. Serana may not engage in dialogue post battle. You can use the console command killall, ending combat and allowing you to speak with Serana and the bars will open. 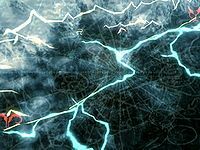 10 After discovering that Dexion has become blind, I've had to secure alternate means to decipher the Elder Scrolls and locate Auriel's Bow. It's been suggested that I might be able to read the Elder Scrolls myself if I use an ancient technique performed by the original Moth Priests. I'm now on my way to a place known as the Ancestor Glade to discover the origin of the mysterious ritual. 50 I've used the unusual knife to collect the bark from the Canticle Trees dotting the Ancestor Glade, which has in turn drawn Ancestor Moths to me. I've felt a surge of energy run through my body and I feel drawn towards the large column of light in the center of the Glade. 60 I'm now standing in a column of light which appears to stretch into the sky at the center of the Ancestor Glade. According to Dexion, I've completed the Ritual of the Ancestor Moth and can now read the Elder Scrolls. I'll need to begin with the Elder Scroll I obtained from the Soul Cairn in order to decipher the location of Auriel's Bow. 200 Finishes quest After entering the column of light in the Ancestor Glade, I was able to read the Elder Scrolls. I had an incredible vision that pinpointed a cave entrance far away on the western edge of Skyrim. This appears to be the location of Auriel's Bow. If I'm to stop Harkon from completing the Tyranny of the Sun, I should hasten there immediately. 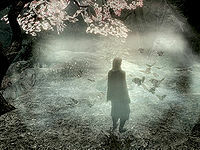 Finishes quest After entering the column of light in the Ancestor Glade, I was able to read the Elder Scrolls. I had an incredible vision that pinpointed a cave entrance far away on the western edge of Skyrim. This appears to be the location of Auriel's Bow. If I'm to complete the Tyranny of the Sun before Harkon, I should hasten there immediately. The following empty quest stages were omitted from the table: 0, 40, 61, 62, 63, 64, 65. On the PC, it is possible to use the console to advance through the quest by entering setstage DLC1VQ06 stage, where stage is the number of the stage you wish to complete. It is not possible to un-complete (i.e. go back) quest stages, but it is possible to clear all stages of the quest using resetquest DLC1VQ06.